What Does A Kennebec River Pilot Do? If a Captain is bound for Hallowell and not licensed to pilot a vessel on the Kennebec River, he is required by the U.S. Coast Guard to engage a Kennebec River pilot. To pilot the Kennebec you must have shore markers to steer by because they do not move. They will show you if the buoys are at proper position. Some of the markers along the Kennebec that I used include houses, trees, big rocks along the shore, remains of ice house piers, church steeples, log cribs, CMP towers and tall brick chimneys, but the most important mark is to know the distance you are off the shore. Ice house piers were reliable because you knew the water had to be deep enough for ships to load there. When bound up the river, the first chimney I used was the tall brick chimney in South Gardiner. The next was the CMP chimney at the Farmingdale plant. This one was used by lining it up with a high rock on the west bank and the Methodist Church steeple on Highland Avenue. This was a three way range and a great shore mark. Sometimes a tree you used would be cut down or a house was torn down and I had to make new ranges. Approaching the dredged channel in Hallowell, I used a range through the dredged channel by lining up Old South hand Cox Memorial Church steeples. This range took me up the middle of the dredged channel past Sheppard’s Point and along lower Water Street. A dredged channel is one that has been dredged by the U.S. Army Corps of Engineers. A natural channel is just what it says, a channel that did not need to be dredged. To be eligible to take the Coast Guard exam for a Kennebec River license, one must make a minimum of fifteen round trips over the route. After this, apply to the U.S. Coast Guard licensing division in Portland to take a pilot’s exam. The exam covers rules of the road and local knowledge. Last but not least, you must draw a nautical chart from memory with a scale of 1” to 1 mile for the river you have applied. After successfully completing the exam, you should spend several months as an apprentice on your river route until you are sure where you are going. After getting aboard in Bath you ask the Captain if you can take the wheel and steer the route yourself. The Captain will say “yes” because he does not want any part of it, but the Captain is still responsible for the ship at all times Then when you are ready to dock or undock the ship, it is turned over to the Captain or Mate which ever is on duty, because they know better than the Pilot how the ship handles when docking or undocking. After the ship is clear of the dock, I would take over helm. 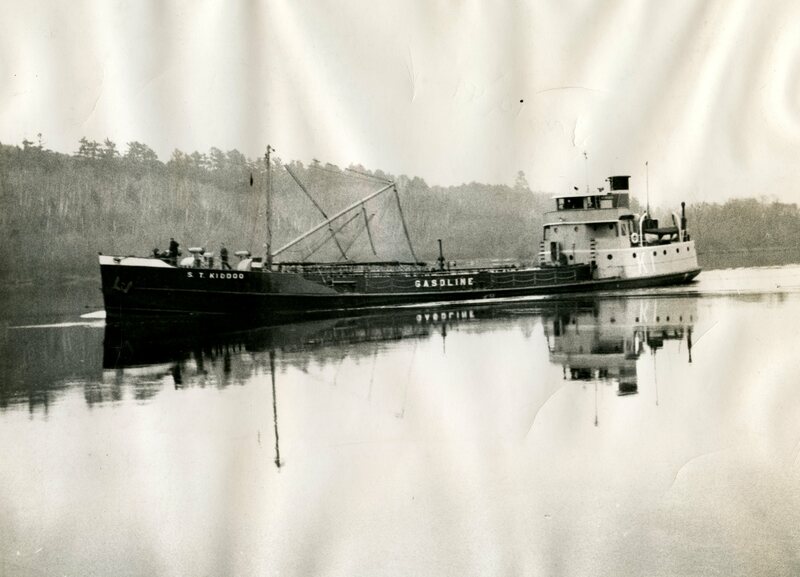 It was always my ambition to go to sea and attain a Master’s License, but along with that I wanted to be a Kennebec River Pilot and pilot tankers to Hallowell. These desires came to fruition and I hold the dubious honor of piloting the last tanker to Hallowell and back to Bath on May 9, 1966. Although I did not know it at the time, it was the last tanker to come to Hallowell because Exxon tied into the Mobil pipeline from Portland to Bangor.